Jodeci (/ËˆdÊ'oÊŠdÉ™si/ JOH-dÉ™-see) is an American R&B quartet with members DeVante Swing, Mr. Dalvin, K-Ci, and JoJo. Formed in 1989 in Charlotte, North Carolina, Jodeci's members began their musical careers as two duos of brothers and, after years of limited success, joined forces. The group's critical and commercial success continued with the releases of Diary of a Mad Band (1993), and also with The Show, the After Party, the Hotel (1995), where the group experimented with various musical styles typically not associated with traditional R&B. In 1996, they announced a hiatus (though continuing to work on music as a group), which prompted K-Ci & JoJo to branch off as a duo, releasing five albums until 2013, when the group re-united for their fourth studio album, The Past, The Present, The Future (2015). 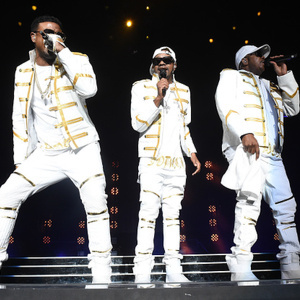 Jodeci has sold more than 20 million records worldwide to date.